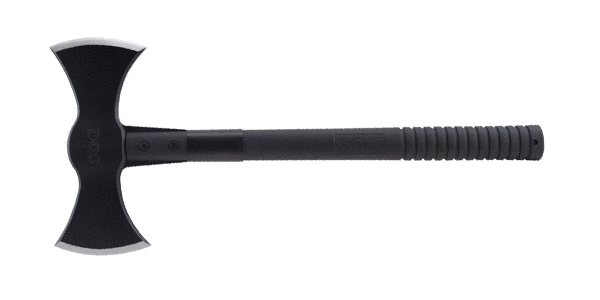 My review today is for the SOG Double Headed Tactical Tomahawk, product number F12-N. There is so much to say about this axe. Firstly, its medieval two-ended design is not only incredibly useful but also very cool in appearance. It is produced by SOG Specialty Knives, Inc., a knife and tool manufacturing company based in the US. As with most SOG products, the F12-N comes with a lifetime warranty, which is great. 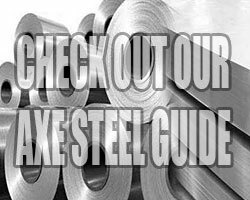 This tool is versatile and durable, and not to mention strong. The 420 stainless steel head with lustrous black finish is fixed to the fiberglass-nylon composite handle with a steel ferrule, as well as two sturdy bolts. Brand: SOG Specialty Knives, inc.
As I mentioned above, this tool is very versatile and efficient. It can be used not only in traditional wood chopping, but also in excavation techniques, obstacle removal, hacking, breaching operations, and more! 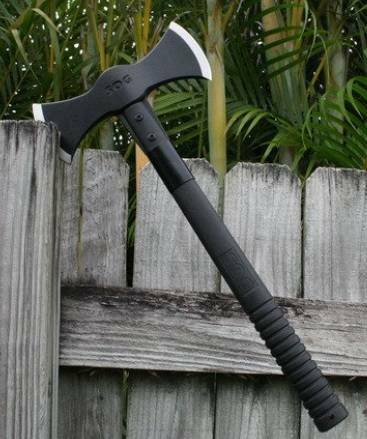 Another great plus is that this tactical tomahawk is lightweight enough that it can be wielded using one or two hands. The head is comprised of 420 Stainless Steel with a hardness rating of 51 – 53 HRC and is bolted to a reinforced nylon-fiberglass handle, so you can be sure that this axe will really pack a punch! The head is coated in a scratch-resistant, hard-case black coating, which gives it a striking finish as well as reduces reflectivity. The end of the handle is ribbed to give you a secure grip and offers a lanyard hole at the bottom if you wish to add something to tie around your wrist to further prevent slippage. SOG has beautifully embossed their logo on both the handle as well as the head, so you can be sure that you have a well-made product in your hands every time you look at it. A sheath is included to ensure that the wielder avoids injury while carrying and that the blade is protected from any corrosion. It is made of very durable nylon and secures around the blade with strengthened rivets and snaps. Aesthetically, it offers the blade an attractive cover that matches the black handle and steel, and it offers a belt loop on the back as a convenient carrying option. Wow, what a great tool! It is a light enough to use with one hand, and robust enough to tackle almost anything you put in its way. With its medieval design, sleek black finish, and reinforced steel and handle, this tool is not only cool to look at, but also incredibly practical, powerful, and precise. With a precision balanced head and handle, you can count on increased accuracy when trying to hit your mark. This double-headed tactical tomahawk is created and backed by a company that offers military-grade tools while maintaining uncompromising style and performance; SOG offers tactical weaponry that showcases innovation, reliability and a distinctive style. While it can prove to be a little uncomfortable to carry on your waist due to its size, there is very little else I can complain about with the F12-N. I recommend this tool for everything from tactical to survival needs.